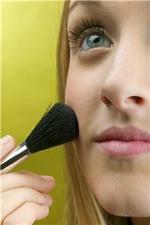 Women have been urged to make double use of certain eye makeup products for a recession-friendly beauty regime. Sarah Richardson wrote in the Daily Mirror that both mascara and eyeliner could be put to more than one use. Eyeliner can also be used as an eyebrow pencil to help define, neaten and shape the brows, as well as colouring in any gaps that might have been created by plucking too much. People were told to use a colour that is not quite as dark as the natural colour of their eyebrow hair. In addition, mascara can be used as an eyeliner by applying it with a lip brush or a cotton bud. Another suggestion was to use face bronzer as an eyeshadow. Further budget beauty tips have been given in the Wrexham Chronicle. Makeup artist Danielle Novak told the paper that either eyes or lips should be emphasised. If one chooses the eyes, she suggested "brighter tones instead of darker mattes ones" and using one shade on the lid.